I have a confession, I love to punch. No, no I am not abusive or anything. But I am in love. In between jabbing and crossing and feeling the impact of my fists hitting the punching bag I came to the realization that well, I am in love with boxing. Max Kellerman, an HBO boxing analyst, proposed that “Boxing is, in fact, everybody’s favorite sport,” and he backs up the claim with a little social experiment, “If you come to an intersection and on four corners you see the following. On one corner, there’s a couple kids playing stickball. On the other corner, there are some guys that are shooting hoops. On a third corner, there’s a guy just standing there putting a golf ball. And on the fourth corner, there’s a fistfight. There are a hundred people at the intersection. How many people are watching anything but the fist fight?” Please do not try this experiment at home to prove Max Kellerman wrong. But the man has a point, people are drawn to excitement and sometimes that means two people hitting each other. Lately I felt less motivated to work out, feeling like running and going to the gym were such monotonous activities. 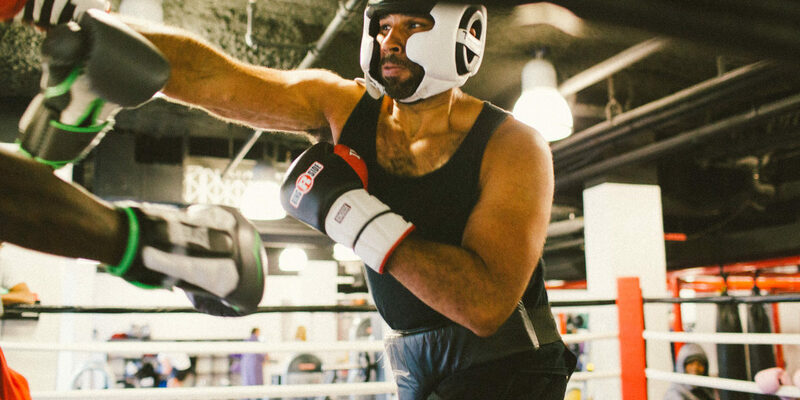 I needed a workout with a bit of a kick (literally) so one google fueled evening I was inspired to find something different, and the search led me to Urban Boxing. After my hour long session of high intensity cardio and throwing jabs, crosses, hooks, and roundhouse kicks at a punching bag, I was exhausted, sweaty, and hooked. It got me thinking, there are a million of sports out there, so why boxing? Great Cardio: Firstly, boxing is a full-body exercise! Muscles all over your body from your abs, back, glutes, shoulders, biceps, deltoids, triceps, quads, hamstrings, you name it, are engaged in every movement. You dodge and throw punches, throw in kicks and knee strikes, and dance around the ring to evade your opponent. In a typical session you start off slow to cover the basics and as you go on you build up the combinations and drills making them more complex which keeps your heart rate high. Every move is high in intensity and whether you are boxing for fitness sake or to fight you are bound to sweat. In a hour session of boxing it is estimated that people burn over 500 calories! All That Confidence: In individual sports like boxing, you build a strong relationship between yourself and your body and you know your strengths and weaknesses extremely well. In the ring and in life you may be placed in difficult positions and you have two options, you can either have faith in your abilities or fear failure. Being able to carry on in the face of adversity requires a certain degree of confidence. Obviously everyone wants to win, at least that is the main objective, but also the point is also to focus on doing your best, a poor attitude in the ring or in life can set you up to lose before the first punch is even thrown. Stress Relief: We have heard it a thousand time, exercise reduces stress and blah blah blah. But with boxing it does more than just that. The thing I love about boxing is that it requires 100% of my focus, I never feel my mind wandering to what I am doing later that day or to the pile of work I have waiting for me at home. With boxing you need to be present or you will get punched, playfully of course. Mental Strength: What I think is super cool about boxing is the link with the basic primal instincts “fight or flight”. It is the most basic and human interaction between people and it has been around forever. I have never been a violent person and I would still not describe myself as violent, but I know that before I started boxing the idea of being punched or kicked scared me. However, when you box you are forced to go against your basic instincts and face the punch straight on. IT’S FUN! Everyone I have ever met and talked to after a session has told me how much fun they had! The sport never becomes boring or monotonous because there are so many skills, combinations, and techniques to master. Once the session ends people want to know more about the sport and want to grow as athletes, they are inspired to watch videos, shadowbox in their living rooms, and fantasize about the next time they get to put on the gloves and punch…or maybe that is just me.